At present there are 3 Ph.D. students doing research work for their thesis in the field of simulation. 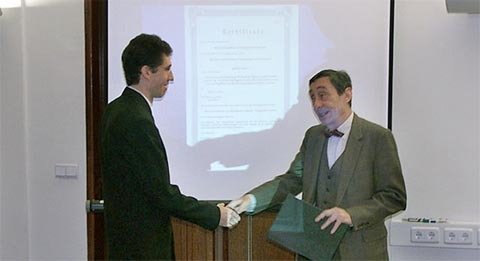 The board of directors at the 2004 board meeting in San Jose decided that the PhD degrees – obtained at universities where McLeod Institute of Simulation Sciences centers are operating and the PhD research work was undertaken in the field of simulation sciences under the supervision of the corresponding center - can be awarded by an international certificate. The first certificate was awarded by the McLeod Institute of Simulation Sciences Hungarian Center to Gábor Szűcs based on his thesis „Optimizing and Modeling Methods of Highly Sophisticated Systems by Artificial Intelligence Controlled Simulation, with Special Emphasis on the Investigation of Traffic Systems”. Gábor Szűcs is associate professor at the Budapest University of Technology and Economics and is engaged in simulation research since the establishment of the Hungarian Center, participating in various national and international projects. The certificate was signed by Professor Agostino Bruzzone director of the McLeod Institute of Simulation Sciences and Professor András Jávor director of the Hungarian Center.